In my family we love to cook and we love to eat. And we’re pretty good at both. In 2000, I collected, typed, printed, hole-punched, and clipped into 30 three-ring binders many of our family’s favorite recipes, including some recipes from generations past. There was a second edition in 2005 that was produced in the same low-tech but mostly effective way, but when it came time to consider a third edition, I knew I wanted to go online. I want it searchable by ingredient or course or holiday, I want folks to be able to pull up our recipes while standing in Publix, and I want this collection of recipes to grow in number and in audience. 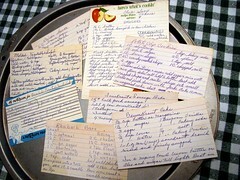 What a great idea to have all the recipes on-line! Looking forward to the finished project (though I suppose it will be ever-changing and evolving as we all try new recipes and variations on old one). Yep! It’ll take some time to get them all up here, but I’m excited too! Okay, I am hooked. Just clicked through the collection of new recipes. Yum! Will we be able to print the recipes out? If you click on the recipe heading, you’ll have just one recipe on the page and can then print it. THere are special “plug-in” applications I’m exploring that would allow for nicely formatted printing. But those cost money, and I’m not sure which I should use right now. I am going through my photos, as well as trying to take new pictures of new recipes as I make them. I think I will start with a yummy drink recipe I just discovered. I should email photo and recipe to you, right? I can only use digital pictures, FYI. Would a digital photo be one taken with an iPhone? Hope so, because that is what I have. “Not Your Mama’s Raspberry Lemonade” forthcoming.